I’m still holding out hope. Graphics used with permission and link back to sources. Some source sites are age rated. I have fun stalking the darker corners of the webs sometimes, and one of the more fun challenges has been stalking Mike Bilinski, because regular searches for more info on his goth rock band PAGAN lead to so much clutter overload that you need a forklift to wedge through all the pagan historical literature just to find tidbits about the band sprinkled like crumbs, much like needles in haystacks. Here is a compilation of what I’ve gathered so far over the last year and a half. These posts all have lots more links to get you started. PAGAN on facebook is good for update links and what’s happening, but Mike has been announcing new release material all summer on his facebook and instagram, and they are now gearing up for the big album push and tour with a launch party. I got to see the cover announcement last December. I know, you’re saying but what about the music??? Here you go, check out the entire collection so far on Genepool. No particular reason for choosing that site, just looks really good when it pulls up. You can also go straight to itunes and youtube to hear more. 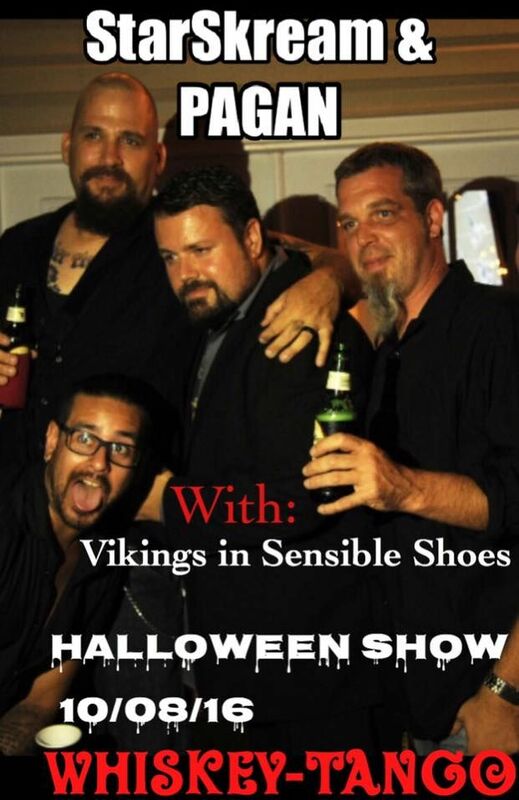 Tour dates will start with the Whiskey Tango in Philadelphia on October 8, and more dates will be added at officialpagan.com as they become announced. Starskream‘s singer Vex features as a guest on one song on Pagan’s new Dead Girls album, and will also fill in at the Halloween party. Guess we’ll see what happens in 2016. I’m continuing this discussion from “gruesome is the new cool“. I’ll paste that part over so you don’t have to click out. And what better day to start than one where I’m spiked up on prednisone again because I had a stupid latex dust reaction in a huge Nike outlet store from pilfering through boxes trying to find an acceptable pair of awesome athletic shoes. My fave Nike Air Trackstar 3 black/metallic silver-white is discontinued, but I found a pair in the UK online almost double the cost, but now the order is pending so I’m crossing my fingers while I wait for response to my contact. Note- I believe mass suicide is a social disease, where a psychopath feeds on the despairing who very sadly fall through cracks and think they find a cool support network where they feel like part of a family. I’m sorry, family won’t kill you. Any belief system requiring your life is erroneous. Why do I love the black Nike death shoe so much? Because when I wear them, they represent living past the despair. I made it. I love that they have become a pop culture symbol and that every time we remember it, we remember those who mistakenly followed a social pervert. When I refer to myself as an ‘evil villain’, it’s not because I’m a psychopath or a social pervert. I’m going to tell you a secret- ok, no I’m not. I’m saving it for the book. You’ll find out why I’m an evil villain when it’s time. Ok, back to real time. It took ten days for me to realize that order would remain pending forever because whoever constructed that particular website didn’t allow for orders to fall through cracks when an item is sold out. The rest of this discussion is a result of me doing more research attempting to get the closest thing I can to original Nike death shoe. Having worked in big retail selling intimates for five years, I’m aware that many customers don’t realize they can migrate to ‘new’ styles when they become frustrated over something like their favorite bra being discontinued. To freshen merch and push new sales, styles are sometimes recycled with very minor changes (a stitch change) and then renamed. Same thing happens with shoes. 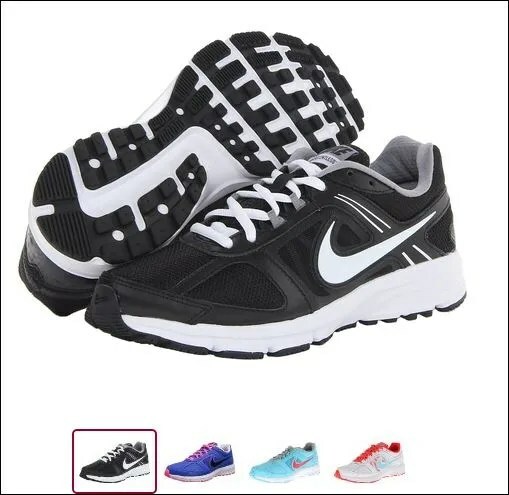 Nike ‘death shoe’ sales (black with white swoosh), as I’ve been told by sales associates in shoe stores, are actually top selling shoes, so it doesn’t make sense to stop making them. It is understandable, however, why a company would choose to dissociate with a negative image like the Heaven’s Gate mass suicide in 1997. But that was nearly twenty years ago, you say. I know, right? If people still want it, why can’t we get it? It’s not like we’re all going around killing ourselves. 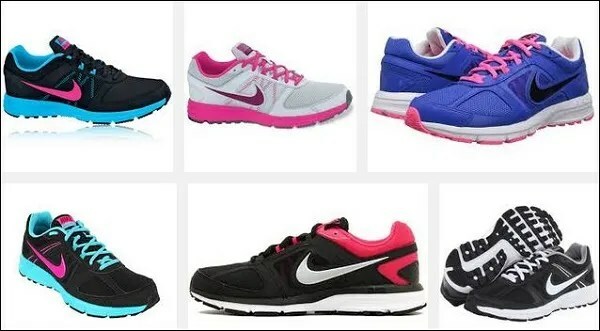 The shoe in the above picture, Trackstar 3, was among the next gen from the original Decade, and this subtle change has continued through the years until it’s very difficult to score a black Nike with a white swoosh any more that still looks close to the original Decade. The closest that I can find that is already discontinued (2014) is the Nike Air Relentless 3, which is a truly awesome shoe. You can still find some sizes on sale, but my size is already long gone. Click the pix to see more. And now Nike truly steps away from the original Decade with the 2015 Relentless 4, inserting leopard spots on a gray background. 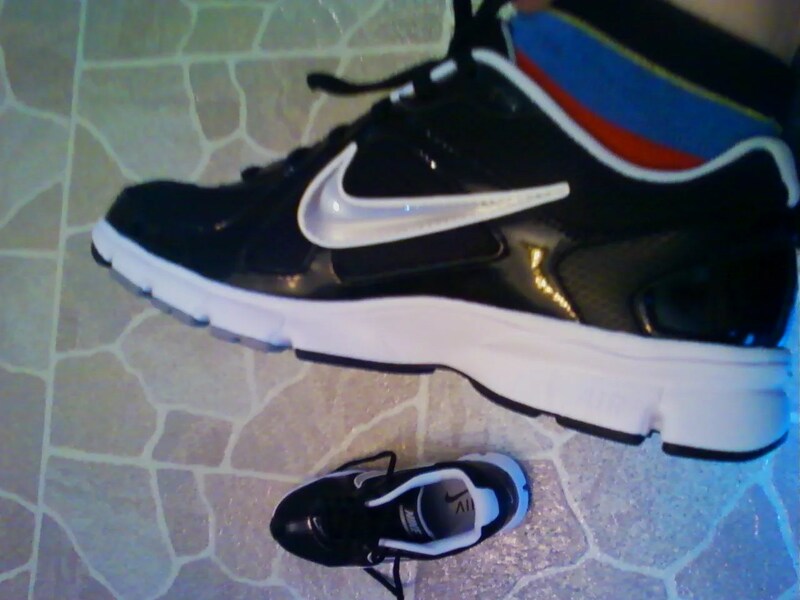 Keep in mind I’m still trying to keep the same fit I had with my Trackstar 3. The problem is, I’m not a leopard spots person. You can still get Nike black with white swoosh in other styles. You probably didn’t know there is this much awesome out there. Click the pic to see way more. You’re welcome. Originally posted 4-18-15 on Facebook. I don’t know about your feeds, but mine gets hit a lot with “Build your blogging empire”, and when I click “See more” I get things like “Even if you hate to write” and “Even if you don’t have time.” Basically, you can click to buy into a blogging plan now, promising riches and fame. I love blogging, and apparently I’m doing everything wrong. I turn off ads whenever possible, even to the point of paying for blogs so no one has to see them. I don’t invite guest bloggers, and, I know this is ludicrous, I don’t encourange comments. Whaaaa? I started blogging 11 years ago to amuse ~myself~. Blogging has gotten me through a whole load of bad stuff happening over and over and over, and I needed distraction to handle the stress. Word out there is that being savvy is about content creation, so- click into a plan? Seriously? I can’t help feeling the compulsion to point out that setting a string of bots in motion is about other people making money, and slapping your name on it doesn’t make it your content. In my own eyes and experience, blogging is like intellectual performance art. I’ve noticed bloggers around me using blogs to dump their junk, police tape their political lines, and reshare other people’s opinions and statements (like we need another news feed in the millions proliferating like viruses). You know what? I want to see what you ate for supper, what your pets are doing, that nasty cut you got on your toe. Your version of how your day is going or the weird dream you had is why I’m reading your blog. I love my blogging empire. Most of it is actually private. If I made it all public right now my reader traffic would go crazy. I would be the focus of so much attention that my twitter would skyrocket and my facebook would explode. So why don’t I go for it? Why don’t I spill and reap the rewards? Good blogging isn’t about getting comments or drawing crowds, although those are sweet rewards sometimes. Good blogging has nothing to do with how other people rank your site or whether you get money rolling from passing along other people’s ads. You know what good blogging is? Filtering out all the bots and spam that stack up your hit counter (auto-hit followers are so cheap to buy everywhere you go), cutting out the crap loading into your readers’ eyeballs, and writing. That’s right, if you hate writing, why in the world would you set up a blogging empire? That’s like someone clicking into a plan to set up a hit song empire and it doesn’t matter if you’re tone deaf and never listen to music. It’s all about someone else selling something and using your billboard as screen to screen sales while they steer customers along the information highway for you. Content creation is like everything else, you either enjoy it or you hate it. I have refused to be paid for content creation for several sites for years because I know the second I get paid, I’ll hate it. Yes, I have days where I don’t feel like working, but it’s way easier working for myself at my leisure than drumming my fingers forcing content I don’t care about for someone else. I’ll be honest, I’m really good at doing that, and that is why the offers show up. I can easily fill 50 pages with content. So why don’t I? Some years ago, someone got after me for wasting time playing on one of my blogs when I could be spending quality time on real writing. At the time I wasn’t sure why that made me feel so uncomfortable. I’ve come to realize that, while not exactly an insult to my person, that statement was a judgement about me as a person, since spending quality time on something I enjoyed and that contributed to my psychological health was a waste of time. That means I am a waste of time, space, and air on this planet, by logical extension. After a good think, I decided that nothing I create online has ever been a waste of time, because it was practice. And I’m getting really good. Despite all the moaning on twitter, it’s actually very easy to publish. I know people who’ve done it. Your writing can be super crap and your actual hard copy books will still wind up in warehouses all over the world. The secret? You pay for the service. I think it’s a great idea. It may not guarantee sales, but it certainly guarantees that you’re a certified author. The only problem with publishing hard copy is that there are no take-backs. I can go back years into my blogs and keep fixing typos. Once a book is out there, I can’t fix a thing on it any more. My blogging empire is my way of gaming through my day. I like making fun stuff for readers to find, lots of easter eggs and presents and pretty colors. I like seeing someone in another country spend a whole day reading every single public post I ever wrote and keep discovering all the reading pathways I’ve created. I like how my hits suddenly triple one week when I say one particular new word somewhere, and still no one ever comments, which makes it even more obvious that lurkers are enjoying the game, too. If I were pushing traffic through a blogging plan full of ads and other people’s curated content (can we say copied public content? ), I would completely miss the personal readers showing up. I see you guys. You give me warm fuzzies. I love all of you. ALL of you. I’m going in a definite direction. It’s not about making money, although, yes, that would be a nice side effect. #aspienado is a thing. I am the first to hashtag it, the first to say it, the first to own it. Existential Aspie is something I can’t stop. What will happen? I don’t know yet, but I do know I’m going to be the first to say a lot of things.